The comment period for providing feedback on the discussion paper has closed. A draft Northern Ontario Multimodal Transportation Strategy has been posted for comment until September 15, 2017. This paper was prepared with technical support and input from IBI Group. The Ontario Ministry of Transportation (MTO) and the Ministry of Northern Development and Mines (MNDM) are developing a Northern Ontario Multimodal Transportation Strategy (NOMTS, or the Strategy). NOMTS will help implement the Growth Plan for Northern Ontario, 2011 – a plan that recognizes the interconnected contribution of people, communities, infrastructure, and the environment to a successful and sustainable economy in Northern Ontario. The Growth Plan and NOMTS have a planning horizon to 2041. This discussion paper summarizes the findings of comprehensive technical analysis across transportation modes and related topics in Northern Ontario. It also reflects the iterative and pan-Northern input and advice received to date from industry, federal and municipal partners, residents of Northern Ontario, First Nations peoples and communities, Métis peoples and communities, urban Indigenous peoples, and various social service providers and organizations. MTO and MNDM are seeking input and feedback on the findings, issues, opportunities and emerging strategic directions described in this paper. Through this discussion paper, you are invited to learn about the Northern Ontario Multimodal Transportation Strategy, and provide your input. We invite you to answer the discussion questions included in this paper and send us your input. Additionally, a series of Public Information Centres (PICs) are taking place this fall in Northern Ontario, where you can meet project staff, ask questions, and provide input in person. MTO and MNDM have worked closely with Indigenous communities on the work conducted to date on NOMTS. A series of regional outreach sessions are organized for this fall, specifically to discuss NOMTS, share information and seek input from Indigenous communities at this important stage of NOMTS. Please see the How to Participate section, or www.nomts.ca, for more information on outreach dates and locations. The Northern Ontario Multimodal Transportation Strategy will be Ontario’s first pan-Northern, integrated multimodal strategy that considers road, rail, air and marine transport modes, and other important aspects of transportation. The Strategy, once drafted, may identify new or improved transportation policies, programs and partnerships, as well as recommended infrastructure projects, to enhance Northern Ontario mobility and support Growth Plan for Northern Ontario objectives. It will also recommend ways to improve data collection for increased and ongoing understanding and monitoring of the Northern Ontario transportation system. 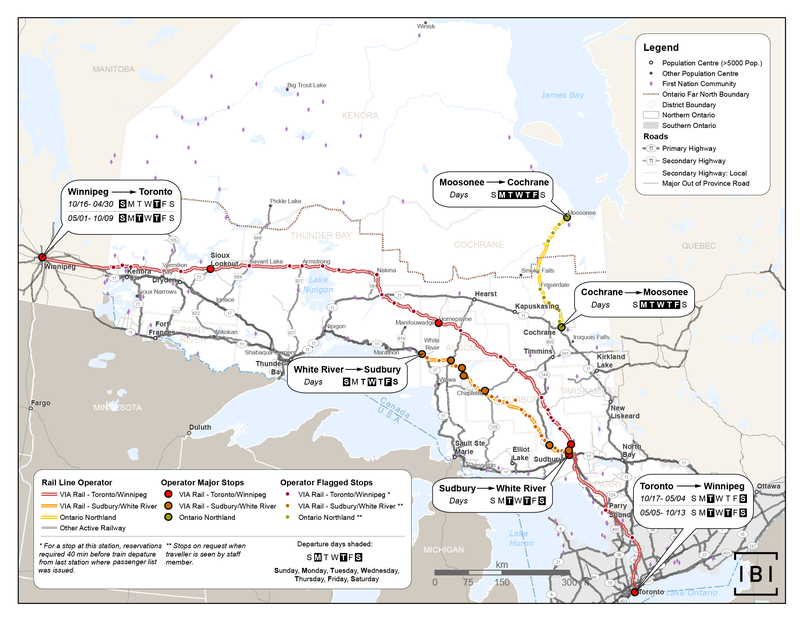 After the release of the Growth Plan for Northern Ontario, and leading up to 2015, MTO undertook several detailed background studies of the Northern Ontario transportation system. These included researching the transportation requirements for Northern Ontario economic sectors, as well as conducting commercial and passenger vehicle surveys. From 2015 onwards, MTO and MNDM have been conducting and leading work to inform the final Strategy. The Draft Regional Assessment Report, The Northern Ontario Context: Implications and Considerations for Strategy Development was posted for public review and comment in June 2016. All studies and papers can be found at www.nomts.ca. As of fall 2016, the transportation system analysis phase is being informed jointly by subject-specific expert input as well as analysis of data and technical information by the study team. Hundreds of organizations and people, including industry and businesses, public-sector agencies, other governments, and Indigenous peoples, communities and organizations, provided input into the transportation system analysis phase of the project. They participated in surveys, interviews, working groups and technical forums. The integration of different topics and writing of the Strategy will take place through late 2016 and into 2017. A draft Strategy will be developed for consultation, prior to finalizing the Strategy by the end of 2017. Emerging draft strategic directions for consideration. Nine technical papers have also been written on a variety of transportation modes and topics. These papers are posted in draft on the www.nomts.ca website. It is not necessary to read the technical papers to be able to understand and comment on this discussion paper. The purpose of this discussion paper and the associated engagement activities planned for fall 2016 is to obtain input on whether the priority issues have been appropriately identified in this discussion paper, and to obtain feedback from the public, Indigenous peoples and communities, and partners, on the directions that should appear in the final Strategy. All feedback and comments on the discussion paper will be considered to inform the Strategy. This discussion paper is designed to help as many people and organizations as possible participate in helping to shape a 25-year transportation strategy that reflects their vision for Northern Ontario. It is available for download at www.nomts.ca. As you read, you can comment on the overall findings, priorities and emerging strategic directions that could form the Strategy. You can also focus on a topic area and provide detailed feedback. In terms of in-person outreach, you are invited to attend Public Information Centres (PICs). Please visit the project website for further details on the PICs at www.nomts.ca. Outreach sessions are also being organized with Indigenous communities. Please contact MTO at 1-866-201-3207 for more information about Indigenous outreach activities. The multimodal transportation vision for Northern Ontario supports the vision and policies of the Growth Plan for Northern Ontario 2011, and sets out the aspiration to both meet the needs of today and be prepared and resilient to support the needs of the future, whatever it may hold. To assist in achieving the stated vision, planning objectives are being used to organize and focus the NOMTS work. These objectives are the result of extensive external outreach. They have been used by the project team as criteria for issues and emerging directions. Northern Ontario’s transportation system is responsive to economic, social and environmental needs and change, and is transformative in supporting new economic activity, healthy communities, and a cleaner environment. Do you have any comments or suggestions regarding the vision statement and planning objectives? Would you change them, and if so, in what way? The population of Northern Ontario totals over 780,000 people, and includes over one-third of the Indigenous population in Ontario. Just over half (57%) of the population lives in the major urban municipalities of Greater Sudbury (20%), Thunder Bay (14%), Sault Ste. Marie (10%), North Bay (7%) and Timmins (6%).1 Outside of these centres, people live in and around the region’s 144 municipalities, in unincorporated areas, or near and within First Nation communities. Over 100 First Nations and Métis communities are located throughout Northern Ontario. 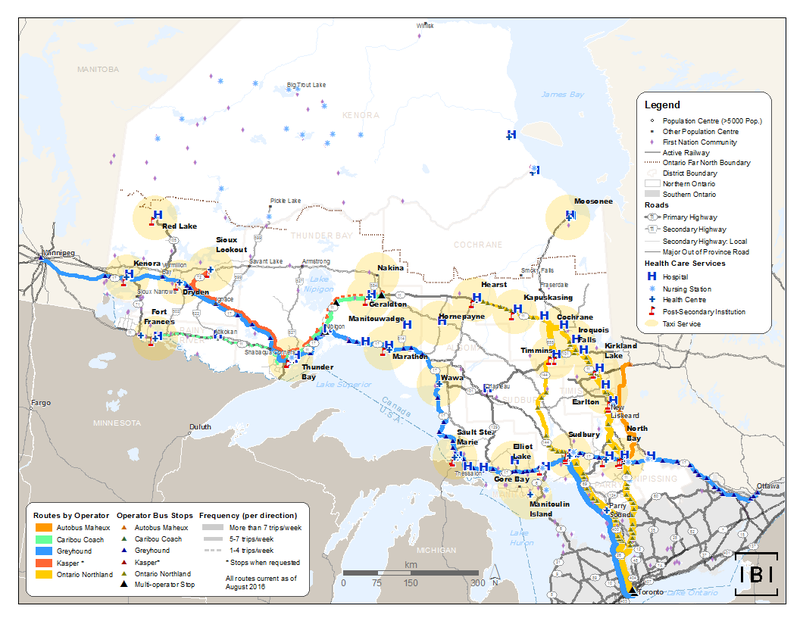 First Nations communities have varying degrees of connection to the region’s broader multimodal transportation system; some with direct connections to provincial highways and others that are accessible only by winter roads or air. The majority of Métis peoples live in urban centres that are connected to the provincial highway network. An issue heard clearly through outreach is that transportation for daily life can be a challenge in Northern Ontario. Whether you are a resident trying to get to a service, or a provider trying to serve clients, getting to where you need to go (e.g., work, medical appointments, classes, job interviews, visiting family members) as well as emergency trips (e.g., medical transport, firefighting) may not be simple in Northern Ontario. Improve and increase options for travel services between communities (bus, rail and air options), and provide connections where possible for communities that currently do not have service. To improve the car and bus travel experience, take steps to enhance the safety and reliability of the highway network, increase its resiliency to climate change, and in the event of closures or service disruptions. Enhance everyday transportation for people needing to get to work or school, to services such as medical or legal appointments, or making other basic trips, including within urban areas where there is little infrastructure supporting more active transport (e.g., cycling). Improve and bring more consistency to road connections to First Nation communities in terms of their ownership, road surface, and maintenance. Does this chapter cover all the important issues and findings? Is anything missing related to the role of transportation in Northerners’ daily living? There are additional areas for action associated with remote communities. See Chapter 5 for a discussion of the unique transportation issues for remote communities. The highway network is the backbone of the Northern Ontario travel network. As vehicles become more efficient, and ultimately self-driving which could open up new travel options, the highway network will still need to be maintained and improved to provide safe and reliable connections between Northern Ontario communities, to the south, and to neighbouring jurisdictions. There will remain in the foreseeable future a heavy reliance on personal automobiles as well as using bus services to travel between communities for work and business activities, shopping, appointments, family or social connections, and other needs. Population levels are projected to remain relatively stable over the next 25 years. 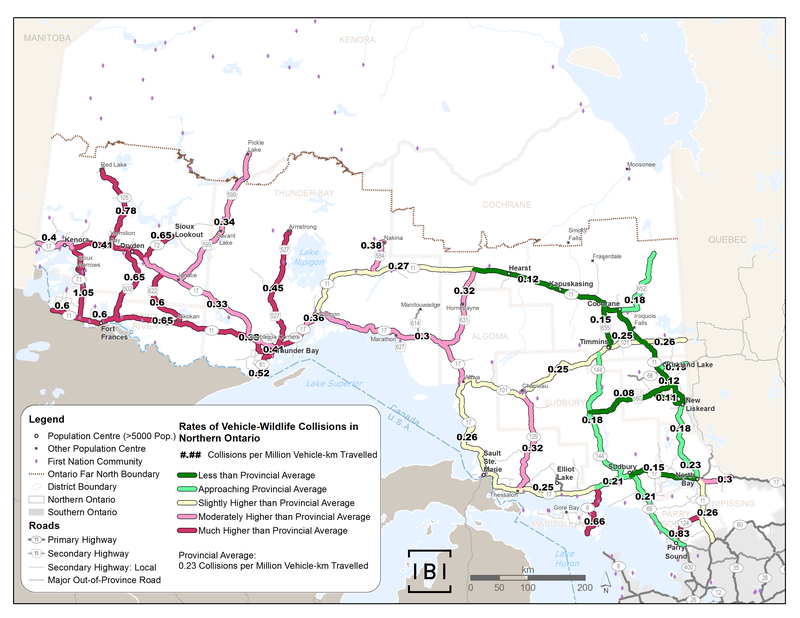 Some highways with the highest anticipated passenger vehicle travel growth include links between Northern Ontario and faster-growing regions to the south and west, in the vicinity of Sudbury and North Bay (which are expected to see slight growth) and in Kenora District, especially related to growth in First Nation communities. At the same time, long-distance commercial vehicle traffic is anticipated to grow, especially throughout the Trans-Canada highway network (see Chapter 4). Improvements are needed to address existing issues that passenger vehicle drivers experience in those areas when sharing the road with a significant proportion of large trucks. 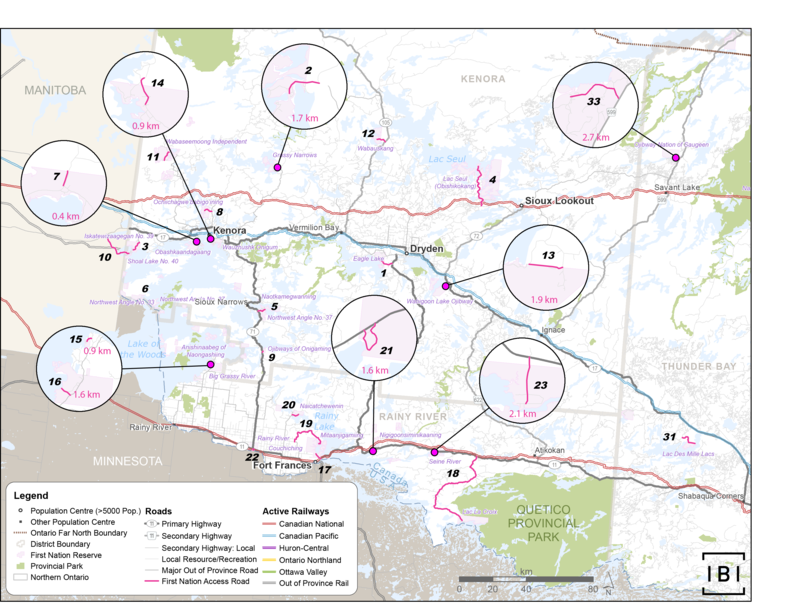 The top highway-related issues identified by residents of Northern Ontario through NOMTS engagement and technical analysis, include the need for improved network reliability and resilience. This includes redundancy (alternate routes) and effective real-time information on highway conditions in the event of temporary road closures, reduction of highway collisions (especially wildlife-related collisions), additional passing lanes or four-laning of routes to reduce delays and overtaking collisions, and addressing significant existing gaps in rest stops and cell phone coverage. Commercial truck drivers and tourists share many of these same highway issues as residents. Additional issues unique to supporting industry are discussed in Chapter 4. Roadway reliability refers to minimizing the number of temporary road closures. Reliability of roads in Northern Ontario is challenged by weather-related issues, collisions, and potential for infrastructure failures (e.g. related to bridges and pavement). Redundancy: having a feasible alternate route to use when a roadway link is temporarily closed. Real-time information: obtaining roadway closure information quickly to allow drivers to plan their route accordingly and reduce delays. Recovery: the ability to restore service on the closed roadway quickly. Where there is no redundancy, motorists’ only option is usually to wait for the highway to be re-opened. 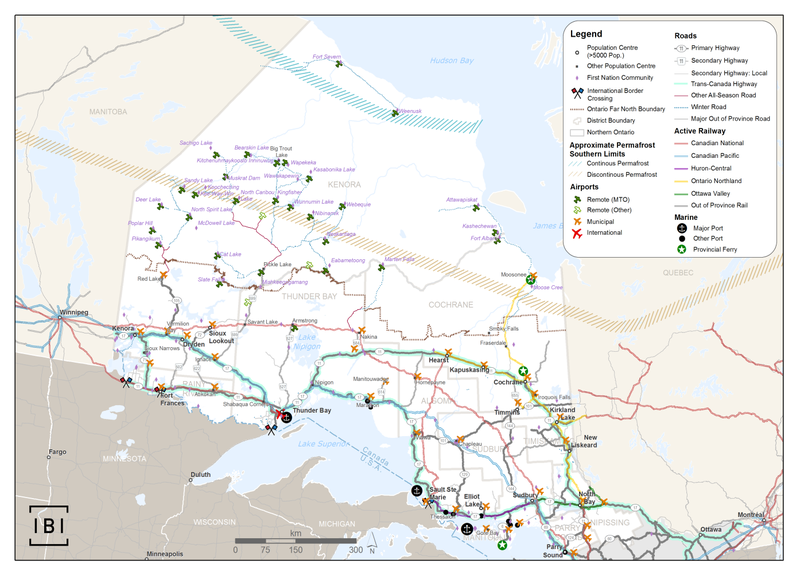 Reliability and resilience deficiencies can hamper tourism travel experiences on promoted Northern Ontario driving routes, delay bus and personal vehicle passengers, and limit emergency access to sites on the affected corridor. Figure 3 identifies the four non-redundant highway segments in Northern Ontario, as well as the sections of highway with long associated detour or alternate routes in the event of a partial or full road closure. Near these non-redundant segments and other locations, MTO operates permanent changeable message signs (CMSs). There is potentially an opportunity to review the types of messages displayed on the CMSs as well as explore the opportunity to expand the number of CMSs to ensure that CMSs are located in strategic locations with the highest need. In addition to CMSs, MTO operates the Ontario 511 telephone and online service, which is one of the more comprehensive sources of real-time information on the status of provincial highways. The telephone service is voice-activated and provides information on road closures, weather conditions, and construction projects. The website offers more detailed information, including maps and traffic cameras, and a pilot route planner that provides the best driving route taking into account road conditions and closures. While Ontario 511 provides a wealth of information, it is limited to information about provincial highways, and travellers must have internet or cell phone service to access it. As discussed later in this chapter, there are gaps in broadband service along the provincial highways in Northern Ontario. Another important issue to drivers is safety; including vehicle-wildlife collisions (see Figure 4). Moose, deer, bear and wolf are among the animals with which collisions can cause injury and damage due to their size. Such wildlife-vehicle collisions are more prevalent, when compared on the basis of vehicle-kilometres travelled, through much of Northwestern Ontario, on Highway 6 to Manitoulin, and on Highway 124 between Parry Sound and Sundridge, possibly related to higher densities of wildlife and long stretches of road with low traffic volumes in that region. Wildlife collision mitigation efforts used in Ontario include fencing along highways and widened brush clearing, which can help reduce or lessen the severity of these collisions by expanding drivers’ range of vision and reaction time. Wildlife collision mitigation measures must be carefully considered on a site-specific basis, to minimize impact on wildlife habitat connectivity and ecological integrity. Overtaking incidents and driver fatigue are also causes of vehicle collisions in Northern Ontario. Additional passing lanes on difficult terrain road sections can be a means of addressing these types of collisions. More frequent rest stops and better communications can also help address driver fatigue. Highway rest areas not only provide safe places for travellers to use washroom facilities, picnic, or take in the natural vista, they also help to mitigate the effects of driver fatigue by providing places for drivers to safely pull off the highway. MTO provides rest areas on primary (King’s) highways and these are typically maintained from May to October. There are currently no provincial guidelines relating to rest area design and in several cases, they are not well lit. Rest areas are also an issue for the trucking industry, described further in Chapter 4. Rest areas that are not configured for commercial vehicle access are of particular concern to truckers who must consider maximum daily hours-of-service regulations when planning their trips. Figure 5 shows existing MTO and privately-operated rest areas and highlights areas in need of enhanced or new facilities. Collisions and other incidents can be further challenged by a lack of cell phone coverage for long distances, posing a safety risk to drivers needing to make calls for emergency medical and mechanical assistance. This is a challenge both in Northwestern and Northeastern Ontario, especially for routes not on the Trans-Canada highway. In Northeastern Ontario, there are currently gaps in cell phone coverage west of Hearst on Highway 11, between Sault Ste. Marie and Wawa on Highway 17, on King’s Highways 101, 129 and on secondary Highways 560 and 631. For Northwestern Ontario, cellular gaps exist along Highways 502, 622, 599 and 527. In addition to enabling safer transportation, wireless communications technology also has a role to play in enabling peoples’ transportation in Northern Ontario. For example, reliable cell phone and broadband coverage could enhance the ability to arrange carpooling, organize shopping assistance among people with limited access to personal vehicles, and utilize smart phone apps aimed at improving mobility. See Figure 6 for existing mobile phone coverage in Northern Ontario. Intercommunity bus and rail transportation refers to public ground-based travel between communities. In Northern Ontario this can sometimes encompass very long distances. Passenger bus and rail options have declined in Northern Ontario over the past decades. Significant portions of Northern Ontario have few or no public intercommunity transportation options. When making the trip by personal vehicle is not possible, people may seek transportation through facilitated ride sharing, taxis where available, the goodwill of others, and social service organizations. For routes or regions of Northern Ontario currently served by scheduled passenger service, the existing service offerings may be limited in their frequency (e.g., perhaps running only 1–4 days per week) or have only certain – sometimes inconvenient – schedule times available, such as during the overnight period. The Ontario Northland Transportation Commission (ONTC or Ontario Northland) is a provincial Crown agency that provides intercommunity bus services from Northeastern Ontario to Southern Ontario along the Highway 400/69, 144, and 11 corridors. In addition, the ONTC provides passenger rail service from Cochrane to Moosonee. In 2012, a passenger rail service from Toronto to Cochrane, operated by the ONTC, was canceled; however the ONTC continued to provide its existing bus service to the communities previously served by the train. As part of a broader, organizational transformation, the ONTC continues to explore its market needs and to find efficiencies in its service provision. For most cases where passenger service reductions and/or discontinuances have occurred in Northern Ontario, alternate service options have not been restored or addressed. While limited intercommunity passenger transportation is a pan-Northern Ontario issue, it is perhaps most pronounced in Northwestern Ontario, based on analysis and feedback from outreach sessions. Passenger bus services are more available relative to passenger rail in Northern Ontario. However, a number of highway segments and many communities are not connected to a scheduled route as scheduled bus services generally operate along major Trans-Canada highway corridors. This issue has become more challenging in recent years with bus operators announcing further service reductions, resulting in more communities without close access to a scheduled route. For example, in 2014, services between Kenora and Red Lake via Highway 105, and in 2015 between Longlac and Hearst, were suspended. Greyhound, a private operator, provides daily interregional bus service from Toronto to Winnipeg via Highways 400, 69 and 17, as well as daily service between Sudbury and Ottawa on Highway 17. Travel times and distances are long (approximately 24 hours by bus between Sudbury and Winnipeg). Schedules tend to ensure that the largest centres, such as Winnipeg and Toronto, have daytime connections. As a result, some Northern Ontario locations are served only in the overnight period in one or both directions by Greyhound. Regional service providers offer additional services and connections needed by Northerners and visitors to the North. Public operator Ontario Northland provides service in the more populated Northeastern Ontario, serving the Highway 11 corridor from Toronto to Hearst, with connections to Timmins. Ontario Northland also supplements the Greyhound service between Sudbury and Toronto, with additional buses, one of which continues along Highway 144 to Timmins daily. Private carrier Autobus Maheux connects North Bay with Rouyn-Noranda in Quebec. In Northwestern Ontario, private operators Caribou Coach and Kasper Minibus provide, respectively, connections between Sioux Lookout and Thunder Bay along Highways 17 and 17, and between Fort Frances and Thunder Bay along Highway 11; both services continue easterly along Highway 11 as far as Longlac. Many Near North2 communities are situated along these bus service corridors, and therefore have access to some service. However, it has been noted through outreach with Northerners that this service can be infrequent and inconvenient, and on some sections of the corridors, connections between their home and the main corridors may not be available, or may be infrequent. For example, Sioux Lookout now has a bus connection to Thunder Bay; however, residents have noted that there is often a need to travel between Sioux Lookout and Dryden, to the west, and there is currently no service for this connection. Residents of the Dryden and Kenora area also often need to travel westerly to Winnipeg (which is six times larger than Thunder Bay in terms of population) for medical care, international flights, and other services, but the interregional Greyhound service can sometimes be too infrequent to serve this need after recent service reductions. Challenges to providing bus service along these corridors include potential liability on the part of the bus service provider when there is an incident and emergency services are generally not readily available. In March 2015 a passenger bus broke down on Highway 17 east of Longlac, delaying passengers for 18 hours in an area with no cell phone service. See Figure 7 for map of existing intercommunity passenger bus services in Northern Ontario, as well as bus service frequency, existing taxi services, and locations of health care services and post-secondary institutions. In addition to seeking more service on more routes, Northerners have expressed a need for bus schedules to be more convenient and responsive to user needs. For instance, more daytime pick-up and drop-off times, and schedules that allow for more same-day return trips. The need for more frequent bus service on busier routes is another challenge noted by Northerners. The lack of infrastructure to shelter passengers in Northern Ontario has been noted as a concern from a safety perspective and when waiting in wintry weather. In many cases, bus stops are located along highways where people must wait either in a roadside passenger vehicle or stand along the highway. Implementing appropriate safety and insurance oversight for smaller public vehicles with less than 10 passengers. Further assurance that safety and insurance requirements are robust, regardless of the size of the vehicle. Building on this input, MTO plans to develop recommendations for an improved intercommunity transportation regime by 2017, including exploring opportunities that could be afforded by the sharing economy. Special consideration will be given to the needs of those Northern Ontario, rural and First Nations communities where currently available intercommunity bus transport may not be in line with demand. VIA Rail’s “The Canadian” line provides transcontinental service two or three times per week on the CN main line through Sudbury, Sioux Lookout and Hornepayne and a number of small Northern Ontario communities, among them. VIA Rail provides passenger service to a number of towns and some Indigenous communities between Sudbury and White River on the CP main line in accordance with legislated direction from the Federal Government, under the Remote Passenger Rail Program run by Transport Canada. Ontario Northland provides the Polar Bear Express passenger rail and rail freight service between Cochrane and Moosonee. This is the only year-round ground-based connection transportation to Moosonee and the James Bay coast. 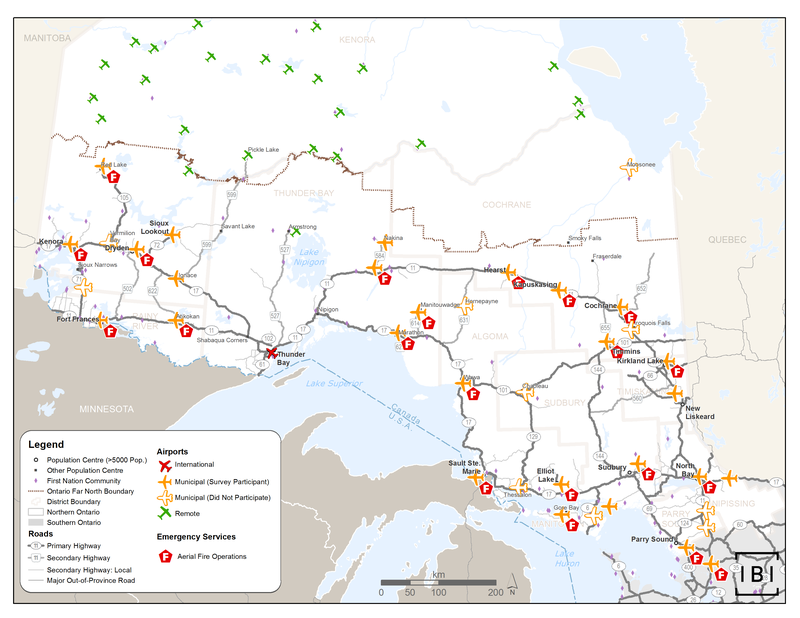 Figure 8 shows existing passenger rail services in Northern Ontario. Sudbury is the only large urban centre in Northern Ontario that currently has a year-round passenger rail connection. Recently, the Algoma Central Railway passenger service between Sault Ste. Marie and Hearst was suspended. The service connected a number of small hamlets, First Nations and camps without conventional road access or intercommunity bus service. Challenges in finding an operator and in negotiating a subsidy with the Federal Government have affected the efforts to reinstate the service. Local efforts, which include support from the City of Sault Ste. Marie and local First Nations, continue to explore options for ensuring this service is available in the future. On this same line, CN continues operating the Agawa Canyon Tourist Train (as well as some freight rail to Hearst). The tourist train is a same-day, round-trip, seasonal excursion to the canyon. In general, bus, rail and air passenger transportation services are not well connected to each other in Northern Ontario. A few municipal transit services connect to airports (e.g., North Bay and Sudbury). Figure 9 shows the current state of passenger multimodal connections to municipal airports. In many cases, airports are located kilometres outside of communities and away from intercommunity bus routes. Taxis can be expensive and are non-existent in some communities. New or improved multimodal connections may be required to better connect people between modes. Community transportation refers to smaller-scale, local bus transportation that typically offers short-distance travel service options. In addition to community transportation services, some municipalities operate municipally-owned transportation systems. These services may include local urban transit, or some other short-distance bus travel. Throughout the early engagement activities for NOMTS, the project team frequently heard about the challenges for people living in Northern Ontario to travel within their own community and beyond to other municipalities and major centres across the region. This is due to the limited municipal transit and local community transportation systems available to the general public. Currently, only 9 municipalities out of the 144 in Northern Ontario provide conventional transit. Further, while there are over 160 agencies, organizations, municipalities and First Nations that provide some form of local transportation service in Northern Ontario, few are well connected to the scheduled passenger bus or train routes. These local services are often tailored to specific clients (e.g., seniors, non-emergency medical transfers), or have some other pre-defined, eligibility scope. Local service providers, who may also provide some limited transportation service to clients or members, are faced with challenges in balancing community needs and service accessibility, while also trying to deliver on specific, and sometimes limited, service mandates. In some situations, providers have to turn away people/passengers who have legitimate and important transportation needs, but may not be eligible under a service provider’s mandate. Without any municipal transit or local community transportation service that the general public can use, many people are left without any means of transportation to get groceries, take children to school or sporting events, and/or undertake other important daily trips. The project team heard the need for reliable and affordable transportation options for disadvantaged or vulnerable population groups such as seniors, persons with disabilities and low-income earners. Create networks of coordinated transportation service that increase capaciy and share resources. While the CT Program has helped to improve local community transportation services, the project team has heard some limitations. For example, First Nations and not-for-profit organizations were not eligible to apply for the program without partnering with a municipality. This was seen as a challenge, as it is common for non-profits and as well as First Nations in Northern Ontario to provide transportation. Over 100 First Nation communities are located throughout Northern Ontario, with varying connections to the region’s broader multimodal transportation system. This section focuses on Near North communities and their road connections to the highway network. See Chapter 5 on Remote Communities for a discussion of the specific issues of winter roads and remote airports. Most communities in the Near North have all-season road access to the provincial highway network; however, there is a wide range among the roads in terms of ownership, maintenance responsibilities, standards and quality. This means that First Nation communities have inconsistent road access, and confusion can arise as to who is responsible for road maintenance, upgrades and ownership. Supporting funding programs currently involved. At least 6 cross jurisdictional boundaries (i.e., Crown land, First Nation, municipal, or local service boards). A variety of jurisdictions or agencies may be involved in the maintenance of these roads. For reference, MNRF is responsible for land use planning on, and management of Crown land under the Public Lands Act as well as the Provincial Parks and Conservation Reserves Act, and works jointly with First Nations to prepare land use plans for the Far North of Ontario under the Far North Act, 2010. Forest access road infrastructure is identified under the Forest Management Planning process. MNRF’s administration of the Provincial Forest Access Roads Funding Program supports the construction and maintenance of primary and branch roads to forests on Crown lands. In addition to the forest industry, these roads are also utilized by the mining and exploration industry, the tourism industry, anglers, hunters, First Nations, utilities, railways and for emergency management. With the long road-based travel distances and dispersed population of Northern Ontario, the region’s municipal airports4 connect people and industry, and help to deliver economic, social, health and security benefits that are considered by many to be essential. Without this network, many public services and programs could not be delivered. See Chapter 5 on Remote Communities for a discussion of the specific issues of remote airports. Most municipal airports are not financially self-sustaining, meaning they do not earn enough revenue to cover operating costs and invest in capital infrastructure. Most are ineligible for federal capital funding because they do not have the population base or demand to sustain scheduled passenger services – a criteria for federal capital assistance. However, Northern Ontario’s municipal airports allow for delivery of essential public services, such as air ambulance, search and rescue operations, and forest firefighting. While vital, these services do not generate profits. While some airports provide most or all of the vital public services listed above, others may only provide one or two, but play an important role in delivering that service. Between now and 2041, as technologies advance (e.g., drones) and some services are delivered differently, the requirements of airport infrastructure will change. However, municipal airports and the conventional airplanes that they serve are expected to have an ongoing role in the Northern Ontario transportation network, the delivery of public services, and the safety of people and communities. The final NOMTS will need to consider how the Province as well as other levels of government can better support municipal airports, given the critical role they play. Finally, while this section has focused on the role of municipal airports in supporting services, they also support passenger travel. Though passenger air transportation may be inherently costlier than bus or rail options, and does not offer the flexibility and range of pick-up and drop-off locations, it is still preferred by many Northerners as a top passenger transportation mode. It is faster than a bus or train, and in recent years, it has also become more affordable. Additionally, without a regional passenger air network in Northern Ontario, many people would have no option for same-day travel to other northern cities. Population growth and prosperity in Northern Ontario cities and communities in the future will depend on the region’s economic growth. The Growth Plan for Northern Ontario (2011) recognizes this and focuses on actions needed to support existing and emerging economic sectors. The transportation system needs to both support current movement of goods and resources, and be diverse and robust enough to support movement of goods related to emerging economic activities and future opportunities. Rail moved over half of this tonnage (and almost half of the estimated total value), approximately 70% of rail tonnage flows being in the form of movements passing through Northern Ontario between Western Canada and the U.S., Southern Ontario or eastern Canada. International shipment of goods through the international rail crossing near Fort Frances represents approximately half of these through movements. Grain shipments from Western Canada to the Port of Thunder Bay for marine export have been a steady component of rail flows, totalling in the order of 8 million tonnes annually. The marine mode moves approximately one sixth of the total tonnage transported in Northern Ontario, primarily moving heavy bulk goods like grain, ore and gravel, largely to/from ports at Thunder Bay, Sault Ste. Marie and Meldrum Bay. 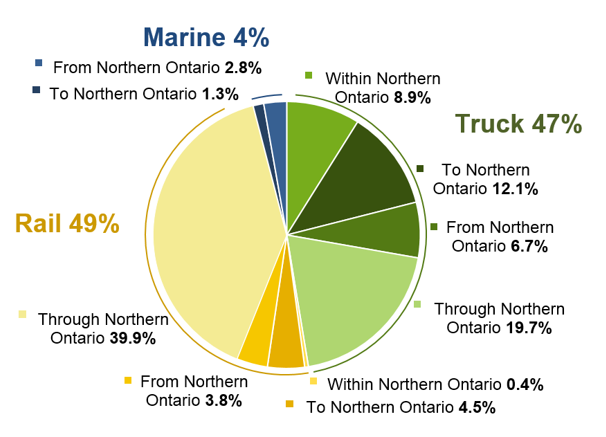 The marine mode represents less than 5% of the total value of goods moved in Northern Ontario, given the relatively low value per tonne of marine-transported products compared to goods carried by other modes. Trucks move the widest variety of goods throughout the region. 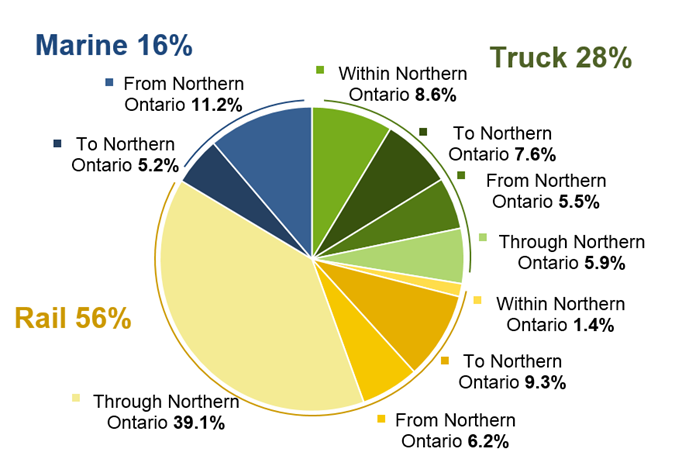 While truck transport represents 28% of tonnage moved in the region, the total value of goods moved by truck is approximately half of the total value of goods moved in Northern Ontario. Well-loaded trucks traverse the Trans-Canada highway system in Northern Ontario between major trucking centres in Peel Region (Mississauga and Brampton), Montreal and Winnipeg. These through trips represent 6% of freight tonnage and almost 20% of the total value of goods moved in the region. Does this chapter cover the most important issues regarding how the transportation system serves industry and other economic activity? What would you change or add to the findings? Source: IBI analysis of Transport Canada data and of 2012 Ontario CVS data. Note that marine figures are for 2011, the latest data available. Source: IBI analysis of Transport Canada data and of 2012 Ontario CVS data. Values are estimated based on typical values per weight by commodity type. Given the importance of these modes today and into the future for moving goods through Northern Ontario, NOMTS will help prioritize investment in supporting a strong highway network for moving goods by road, enhance transportation options for bulk goods (rail and marine), and support the investment in competitive options that attract business and capital investment by new and emerging industry within the region. This section addresses some of the specific transportation issues related to moving goods and supporting economic growth, including tourism, forestry and future economic opportunities such as the Ring of Fire. It builds on and complements the improvements mentioned in Chapter 3, such as addressing highway reliability, resiliency and redundancy, which will also serve to assist tourism and commercial transportation. Ontario will engage with Indigenous partners on approaches to close socio-economic gaps and enhance participation in the resource sector by improving the way resource benefits are shared with Indigenous communities. Commercial vehicle traffic is expected to grow in volume across the Northern Ontario, especially on the Trans-Canada highway, as trips to and from faster-growing regions outside of Northern Ontario increase. Overall, the number of truck trips is forecasted to grow by 67% in the region by 2041 (see Figure 14). The Trans-Canada Highway network has major economic importance given its central role in economic activity and long-haul trucking. 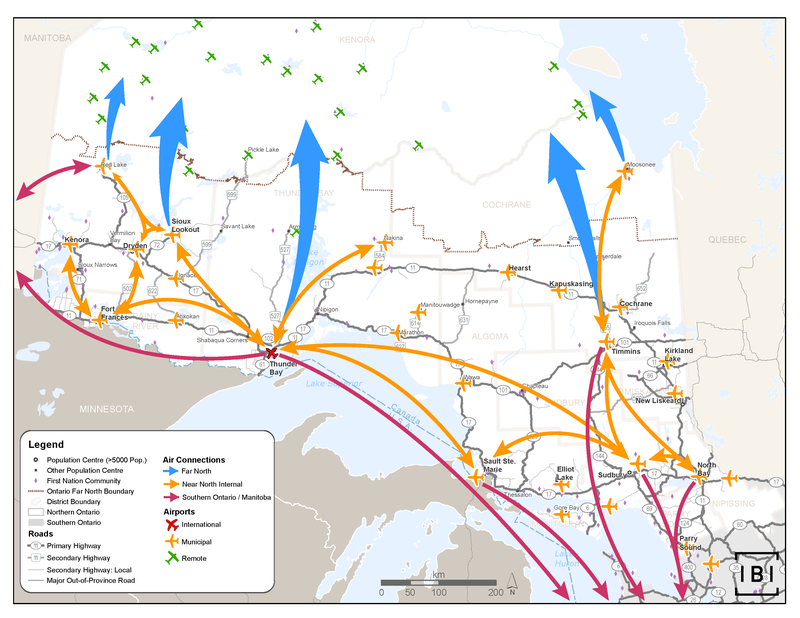 Winnipeg and Thunder Bay, as goods continue to be distributed by truck from Winnipeg’s rail intermodal terminal, airport, and trucking terminals throughout Northwestern Ontario, including to remote communities. Sudbury/North Bay and Southern Ontario, as goods are shipped between Peel Region (immediately west of Toronto), the province’s major trucking hub and home of CN and CP’s truck/rail intermodal facilities, and Northern Ontario and beyond. Highway 11 has recently been fully widened to 4 lanes south of North Bay, and Highway 400/69 is planned to be fully 4-laned south of Sudbury, which will assist with managing this future projected growth in commercial vehicle traffic along these Northern-Southern Ontario links. North Bay and Thunder Bay along Highway 11. With significant highway improvements along this corridor in recent years, as well as flatter terrain and less risk of highway closures in the winter compared to Highway 17, Highway 11 is increasingly being favoured over Highway 17 for long-distance trucking movements through Northeastern Ontario. Northeastern Ontario is a gateway to several major economic centres due to its proximity to Southern Ontario and to Michigan via the Sault Ste. Marie international border crossing. While much of the traffic through this crossing is local in nature, for longer-distance trips the Sault Ste. Marie border is approximately a 5.5-hour drive from Detroit, and a 6.5-hour drive from Chicago. Currently, daily commercial vehicle flows between Northern Ontario and the Toronto area totals just under 2,800 trucks, split quite evenly between Highway 11 south of North Bay and Highway 400/69 south of Sudbury. This goods movement is forecasted to grow by 72% from 1,400 to approximately 2,400 truck trips daily on each of these corridors by 2041. These corridors carry the highest volume of vehicular traffic across all of Northern Ontario, particularly in the summer months when both corridors see significant increases in tourism traffic. In terms of cross-border traffic, the international crossing at Sault Ste. Marie is Northern Ontario’s busiest border for trucks, with more than 50% of cross-border truck traffic occurring there. Cross-border truck traffic is forecasted to grow by 65% by 2041. The four non-redundant sections of the Trans-Canada highway outlined Chapter 3 carry the same implications for commercial vehicles and people alike. Furthermore, for commercial vehicles, some alternative routes may be unsuitable for trucks due to factors such as sharp corners, steep grades, narrow shoulders or other physical features that pose safety concerns. 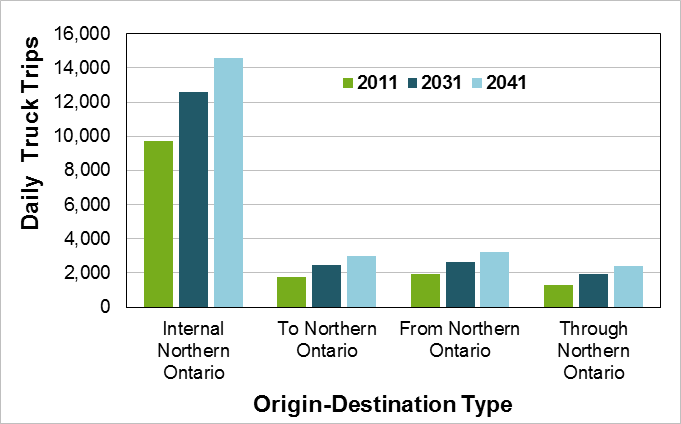 Figure 15 identifies the four non-redundant highway segments in Northern Ontario, as well as the current commercial vehicle flows and commercial vehicle forecasts to 2031 and 2041 for consideration. Through Northeastern Ontario, Highway 11, rather than Highway 17, is increasingly the preferred route for commercial vehicles and goods movement. Highway 11 tends to have fewer curves, flatter grades and is less affected by lake-effect storm closures, making it a more attractive route for truckers, especially in winter. In contrast, Highway 17 attracts more personal vehicles due to its scenic experience. Note that much of the truck traffic is long-haul trips that travel entirely through the region. Long-haul trips for over-dimensional vehicles also tend to occur on Highway 11. Currently, MTO works with vehicle operators on a case-by-case basis to assist with routing plans, as well as strategies to mitigate obstacles, such as raising power lines. More work is being done by the Province to streamline oversize/overweight transportation across the region. Increased truck axle loading accelerates the deterioration of roadway infrastructure through pavement damage such as rutting; the impact of increased truck axle loading on the roadway does not increase linearly with the load, but exponentially. Efforts to facilitate oversize/overweight transportation must be done in tandem with ensuring that the integrity of Northern Ontario highway infrastructure is maintained for all users. In comparing collision rates per vehicle-kilometres travelled, collisions involving overtaking (passing), while a relatively small portion of total collisions, are seen to be higher than the Provincial average on Highway 11 from North Bay westwards– the route commonly taken by truckers travelling across Northern Ontario. There are some passing lanes provided north of North Bay, though these may not be sufficient given the current and anticipated truck volumes on this highway, and virtually no passing lanes west of Hearst. Other two-lane highway sections such as Highway 17 west of Thunder Bay, and Highway 17 through the North Bay and Sudbury areas, also have higher than average incidents of collisions due to overtaking. Highway 11 west of Hearst, among other areas of the Northern Ontario highway network, is also challenged by few suitable rest locations, as well as cell phone coverage gaps. 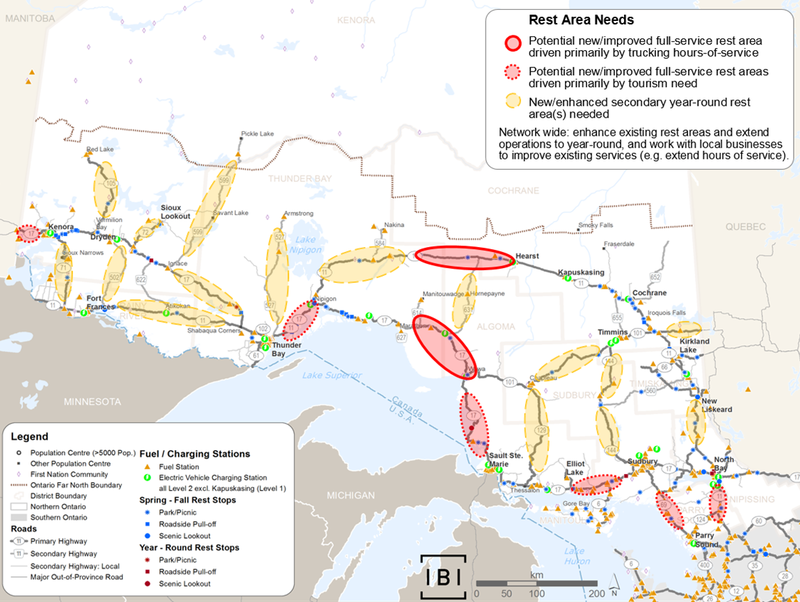 As discussed in Chapter 3, analysis has identified the most critical shortages in rest areas in support of the trucking industry to include Highway 11 west of Hearst. Without suitable all-season rest areas with commercial truck access needed by drivers to adhere to daily hours-of-service limits, drivers take breaks at the roadside or in other unsuitable or potentially unsafe locations, or risk travelling longer than is safe to do so until they find a suitable rest location. Translimit Road (Cochrane to Quebec). Approximately 70% or over 70 million tonnes of the rail freight tonnage moved annually in Northern Ontario passes through the region without stopping. Exceptions include grain moved from Western Canada to the Port of Thunder Bay, forestry-related products moved from Northwestern Ontario to U.S. markets, and ore moved within the Sudbury area. The amount of rail freight shipped from Northern Ontario on Class 1 rail fell by half between 2005 and 2009, and is now holding stable at approximately 6 million tonnes per year. There are two existing shortline railways in Northern Ontario: Huron-Central Railway and Ottawa Valley Railway. The provincial Crown agency Ontario Northland provides rail freight services in Northeastern Ontario. Part of this rail system extends into Quebec and operates as the Nipissing Central Railway, a subsidiary of Ontario Northland. The shortline railways and Ontario Northland rail freight services are currently used by private sector shipping companies to transport natural resource goods, largely forestry, steel and mining products. The Ontario Climate Change Action Plan provides direction to improve the competitiveness of shortline railways, given their potential environmental efficiency compared to trucking. Rail shippers have identified issues such as rail car supply, and need for capital investment as limits to the further use of shortline railways. When asked about the future opportunities for shortline rail in the north, several shippers, particularly of forest products, indicated that the scale of their individual plants relative to major national bulk goods flows means they are disadvantaged when negotiating with the large railways. The result is that they could end up paying higher freight rates compared to large businesses who benefit from economies of scale, and they may have little say in the level of service (i.e., how many days per week their plant is served) and less assurance of available rail cars. As a result, these goods can end up being trucked. MTO is currently working on a commitment to study and take action to improve the competitiveness of shortline rail. Any recommendations or actions which are developed through this work will be incorporated into the final Northern Ontario Multimodal Transportation Strategy. Northern Ontario’s water borders provide important commercial access to Southern Ontario, Quebec, the United States and beyond through the Port of Thunder Bay, the Sault Ste. Marie port and other smaller yet strategic ports such as Meldrum Bay and Bruce Mines. Freight tonnage at the Port of Thunder Bay is relatively stable, while activity at the region’s second largest port – the Port of Algoma at Sault Ste. Marie – has grown by 20% for loaded tonnage and 14% for unloaded tonnage between 2001 and 2011. The St. Lawrence-Great Lakes shipping route is a unique and irreplaceable resource. Cost-effective marine transport contributes to the efficiency and viability of major Canadian bulk commodities such as grain, iron ore, coal, limestone, aggregates, potash, and some steel products. The movement of these heavy bulk commodities by water is more cost-effective and less carbon-intensive than transporting by rail or truck. Marine traffic levels for bulk cargo and other freight are expected to remain stable through the long-term. Into the future, marine shippers may need to consider how to address ship design for potentially lower water levels. To ensure the long-term viability of ports, there is a need to ensure that transportation access routes to ports, as well as lands around ports, are protected against incompatible uses. This protection is required for existing ports and potential future ports. Northern Ontario has a number of ports that were active in the past but are currently not operational, such as Michipicoten Harbour and at Little Current. Protection of port lands and infrastructure may be crucial for supporting the marine shipping needs of emerging sectors and industries, as well as for new or enhanced marine tourism offerings. The Conference of Great Lakes-St. Lawrence Governors and Premiers published the Strategy for the Great Lakes-St. Lawrence River Maritime Transportation System. It includes recommendations to accelerate certain asset renewal initiatives to improve connections between Lake Superior and the lower Great Lakes and to increase icebreaking capacity to extend the marine operating season. There remains considerable capacity in the Northern Ontario rail and marine networks, which could respond well to future growth in certain Northern Ontario industries, including large-scale mineral extraction and other emerging industries. Potential large-scale mineral extraction activities in the Ring of Fire region could significantly increase the demand for transportation infrastructure capacity, including rail and marine freight, as well as rail and marine infrastructure. In addition to capacity on ships and rail cars, there is also potential intermodal capacity in the region. This could include the expansion of rail hubs, such as in Sudbury, to increase their freight handling capacity between truck and rail modes, and/or potential exploration of reviving aspects of the intermodal infrastructure at the Port of Thunder Bay. This infrastructure still exists and is protected, but is not currently operational. Northern Ontario provides a strong tourism product that attracts visitors from both near and far. In 2012, half of visitors to Northern Ontario lived in Ontario, and about a quarter visited from the rest of Canada and the U.S., respectively. The tourism industry is very important to the Northern Ontario economy: over 9,000 tourism-related businesses comprise this sector, which contributed more than $930 million to the GDP of Northern Ontario in 2012. Historic and cultural tourist activities and attractions can be found across Northern Ontario. Many are found around the communities of Kenora, Thunder Bay, Sault Ste. Marie and Sudbury, which are accessible by road from Highways 11 and 17. There are countless other tourist attractions, experiences and activities across Northern Ontario, including outdoor and nature-based activities such as camping, fishing and boating. Private vehicle transportation is by far the most prominent travel mode used by tourists and visitors. To assist tourists with navigating the region’s roadways, some tourism-oriented and logo-based signs can be found along Highways 11, 17 and 69. There is an opportunity to increase tourism-related signage to include more notification of scenic, historical and significant Indigenous areas in Northern Ontario. Tourists may be less familiar than the local population with the challenges associated with driving in Northern Ontario, such as the risks of vehicle-wildlife collision, the relative infrequency of rest areas available, and the potential challenges of sharing the road with heavy trucks. This could contribute to frustrations and safety risks. Improvements and increased information or signage in these areas would greatly enhance the Northern Ontario travel experience for visitors to the region. The passenger rail network in Northern Ontario is limited for tourist use, as the only major urban centre served by rail is Sudbury, though rail does provide access to some of the smaller and more remote communities and activities. VIA Rail provides rail service within the region, and also provides connections to Manitoba and Southern Ontario. There are no direct passenger rail connections between Northern Ontario and the U.S. The Ontario Northland’s Polar Bear Express, which operates between Cochrane and Moosonee, is itself a popular tourist attraction. Near Sault Ste. Marie, the seasonal Agawa Canyon Tourist Train is another popular rail tourism experience. As was noted in Chapter 3, bus and rail schedules for interregional services tend not to be particularly well suited for travel to/from Northern Ontario, and cater more to through traffic. As one example, Greyhound’s overnight scheduling of service eastbound on the north shore of Lake Superior means tourists travelling by bus miss the opportunity to see the spectacular vistas. While there are currently no non-stop scheduled international air services into Northern Ontario, tourists can reach the region through connecting flights from Winnipeg and Toronto. Several other airlines provide service between the municipal and remote airports, allowing tourists to reach smaller communities across the region. Northern Ontario is offering more active transportation options for tourists, including for cyclists. Scenic road and mountain bike trails suitable for cyclists of all skill levels are now found across the region. For instance, the development of the Lake Huron North Channel Cycling Route and the Voyageur Cycling Route are important cycling initiatives from a tourism perspective. The Province’s CycleON strategy promotes the development and expansion of an integrated network of on-road and off-road cycling routes. Through NOMTS, CycleON implementation in Northern Ontario can be supported, ensuring connection to the broader cycling network. The MS Chi-Cheemaun is the most popular ferry service in Northern Ontario. It is operated by the Province’s Owen Sound Transportation Company (OSTC) and runs between the Bruce Peninsula and Manitoulin Island. The ferry serves as a mini-cruise experience in itself, and for tourists travelling between Southern and Northern Ontario, it offers a short cut across Georgian Bay. Numerous challenges exist with expanding the cruise and ferry sector in Northern Ontario, such as lack of destination awareness, customs and border clearance (for foreign cruise lines), and a complex regulatory environment. Growth in this industry will depend upon collaboration between the various governments in the Great Lakes region. The OSTC operates the MS Chi-Cheemaun passenger ferry, as well as the MV Niska I, a landing craft ferry between Moosonee and Moose Factory Island. After struggling with declining ridership for years on the MS Chi-Cheemaun, the OSTC acted on the results of a 2013 market feasibility study, and has now significantly increased its ridership and revenue, and is serving more of the tourism market through partnerships with local communities and stakeholders. By 2015, the OSTC reported the ferry’s vehicular and passenger traffic had increased by 8 and 11 per cent, respectively. 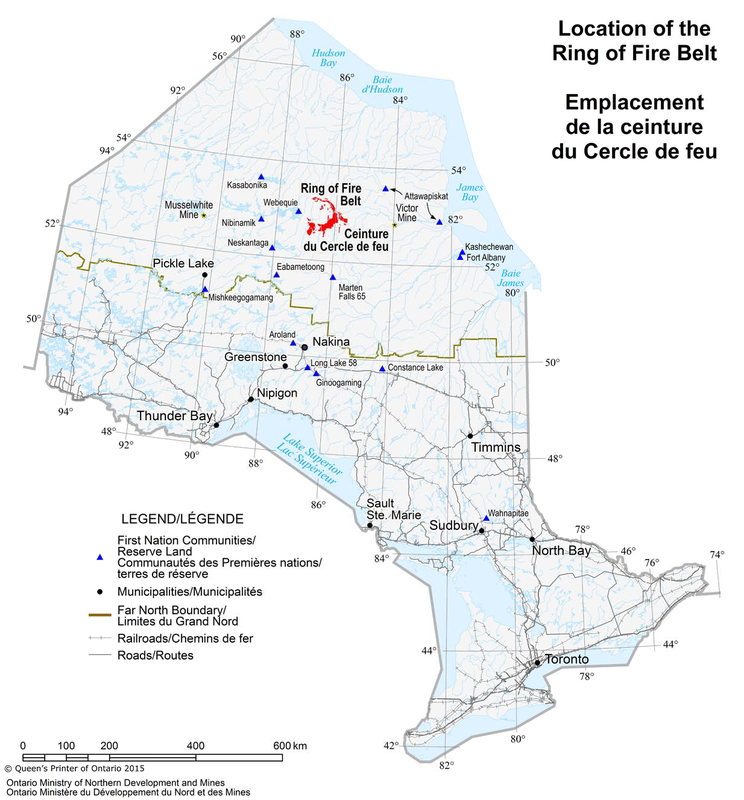 The Ring of Fire region is found in the eastern portion of the Far North (Figure 16), on and near the ancestral homeland of the 9 Matawa-member First Nations. These include Aroland, Constance Lake, Eabametoong, Ginoogaming, Long Lake #58, Marten Falls, Neskantaga, Nibinamik and Webequie First Nations. As of August 2, 2016 there are approximately 10,040 active claim units held by 15 companies covering an area of 1,606 km2. Noront Resources is the company with the largest number of claims. 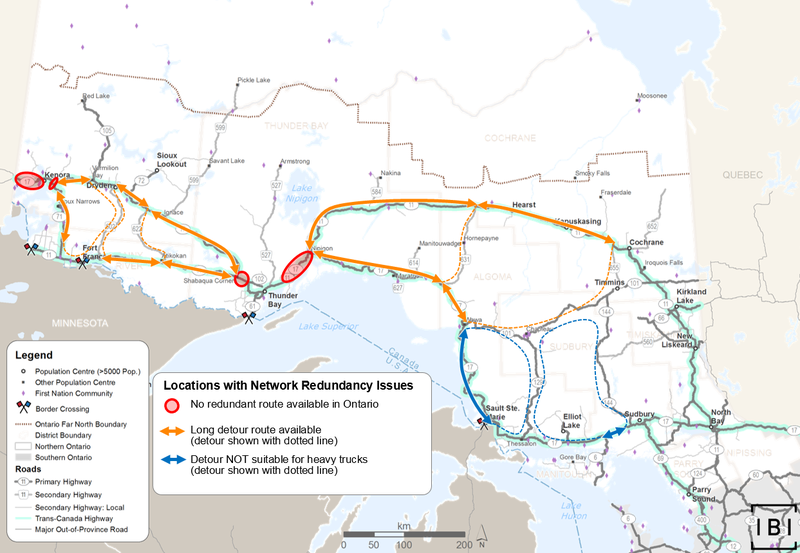 Northern Ontario rail, road and/or marine traffic could grow to serve development in the Ring of Fire. The physical environment presents challenges for building new transportation infrastructure in this region. The Hudson Bay Lowlands, characterized by muskeg dotted with thousands of small lakes and wetlands are not generally conducive to road or rail infrastructure. Being close to sea level, drainage is poor in the region extending to James and Hudson Bays. From an ecosystem perspective, it is one of the largest wetlands in North America, serving as an important ecological region home to many species of birds of prey, seabirds, woodland caribou, polar bears, and arctic foxes, and a major carbon storage area in its extensive peat bogs. As development decisions about Ring of Fire progress, MTO is assisting by advising on transportation infrastructure gaps, requirements and opportunities, for instance upgrades to two major gravel roads extending into the Far North to better accommodate heavy trucks in the future. The bio-economy and clean-tech industries are potential and emerging economic sectors for Northern Ontario. There is currently no world leader in the production of biological energy inputs, refining and production. Northern Ontario has the potential to lead the global trend towards more environmentally efficient energy production through the bio-economy and clean technology. Rail and marine modes would be ideal for transporting bulk loads of biomass to power plants located at a distance from production location. Additionally, the Nuclear Waste Management Organization (NWMO) Deep Geological Repository (DGR) project is ongoing and may require specific transportation requirements over the next 25 years in Northern Ontario. The repository will be a significant construction project, with surface facilities and underground excavation (similar to mine construction) to create the holding areas for the nuclear waste. NWMO is continuing to work with municipal, First Nation and Métis communities in the area, and conduct technical analyses, to select a preferred site for its DGR project. Of the nine host communities still being considered, six are located in Northern Ontario: Ignace, Hornepayne, White River, Manitouwadge, Blind River and Elliot Lake. Selection of the most suitable site is targeted to be made by 2022, at which time the NWMO would conduct a multi-year site characterization study, which could take another 3-5 years. Final detailed site assessment will include examining transportation routings and modes. Once the site characterization assessment is complete, the NWMO would apply to the Canadian Nuclear Safety Commission for licensing approvals. Providing approvals are received, site construction is estimated to begin in 2029, and continue for approximately 10 years thereafter. For more information on NWMO’s transportation planning process, including safety and regulatory requirements for transportation of nuclear waste, visit the NWMO website at https://www.nwmo.ca/en/A-Safe-Approach/Transportation/Transportation-Planning. The Far North of Ontario is one of the largest, naturally intact regions in the Western Hemisphere. It covers nearly half of Ontario’s total land area, with over 200 species at risk such as caribou, wolverines, and polar bears found in the region. Traditional knowledge of the environment, and first-hand information on how changes to the climate are affecting the region, are critical inputs to informing how best to enhance transportation in the region. 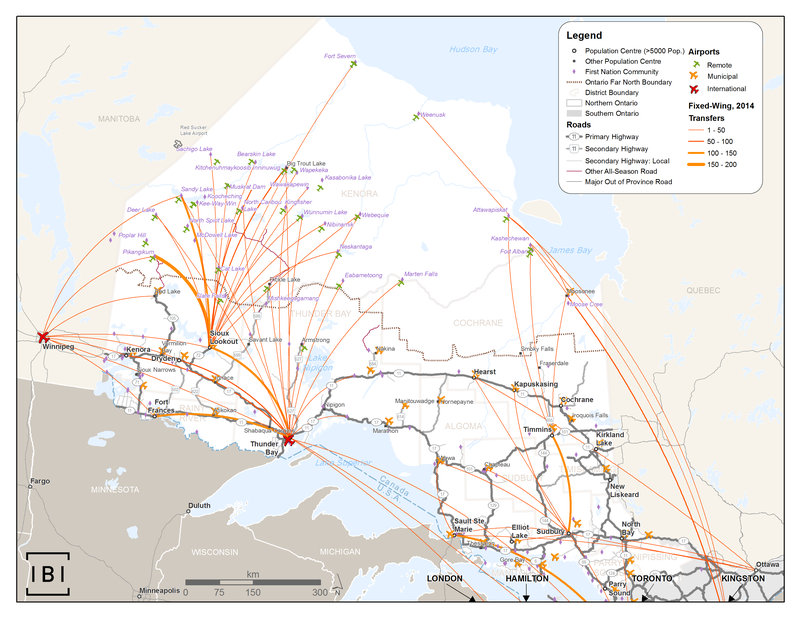 Most Far North communities rely on the 29 MTO remote northern airports for year-round access. In addition to air, Moosonee is accessible by the Polar Bear Express rail line and Moose Cree First Nation by rail then barge or water taxi. Pickle Lake is accessible by Highway 599. During the winter months, winter roads also serve the region. The expense and uncertainty of remote northern travel affects people every day. It affects the cost of food and goods, the availability of goods and professional services, the ability to travel for medical care, keep in touch with family, and otherwise participate in daily activities. The already-present effects of climate change on winter roads, air travel and permafrost degradation. Over the past decades, the Far North has seen growth in resource development, as well as increased interest in developing areas of resource potential such as the Ring of Fire. Development of this region could potentially include all-year ground access to some communities in the future. This Chapter focuses specifically on winter roads and remote airports, and builds on the transportation directions addressed in Chapters 3 and 4 of this paper which will also help improve indirect connections and travel for residents of remote communities in Northern Ontario. Does this chapter describe the most important issues and needs for remote communities? 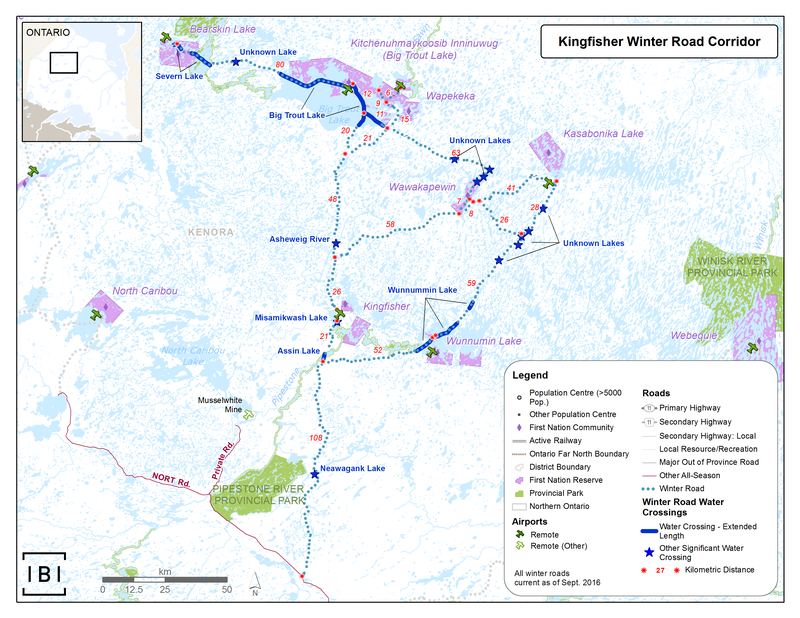 The winter road network serves the majority of remote First Nations communities and is vital to moving heavy, large and bulk cargo into communities, as well as to connecting communities. Owing to ongoing climate change, the season is getting shorter, less reliable, and more vulnerable to intermittent closures. Mobility on the roads is challenged by poor or limited signage, minimal cell phone coverage and limited real-time information on road quality, as there is currently no central source of information on the winter road network. Winter road travel can be dangerous for all drivers under these circumstances. Organizational and funding structures of governments can sometimes complicate winter road transportation planning. There is a need for improved criteria and timing of funding for winter roads, as delays in receiving funds can mean communities may not have sufficient time to plan and build. While all-season road access is being considered at varying levels in Far North communities, the majority of Far North First Nations will continue relying on winter roads for either primary or supplemental ground access over the next 25 years. Given this, NOMTS will prioritize improving the operational condition of winter roads based on technical analysis and First Nations’ input in the short-term, and on extending the winter road season as long as possible through improved construction methods. NOMTS will simultaneously support MNDM, Indigenous and Northern Affairs Canada (INAC) and remote First Nations in pursuing all-season roads where appropriate and desired. Where community consensus is developed; all-season roads could be built to connect communities to the highway network. Under the Far North Act, 2010, most development in the Far North of Ontario, including all-weather transportation infrastructure, is prohibited from proceeding in advance of a jointly approved community based land use plan for the area, unless an order is made to except or exempt an individual project. Where a community based land use plan is in effect, development must be consistent with the direction contained in the approved plan. Authorizations under other provincial legislation, such as the Public Lands Act, and the Endangered Species Act, 2007, may also be required. Of the 32 remote First Nations in Ontario, 15% are currently undertaking tangible activities to construct all-season roads. For instance, INAC is working with North Caribou Lake and Shoal Lake #40 First Nations to construct all-season roads. Four of the five Matawa remote communities are receiving support from INAC and MNDM to realign their winter roads to higher ground with future all-season road development potential, which are aligned to connect to the planned Noront ROF road. One other Matawa member community is currently studying an all-season road route. Additionally, design work for the bridge required to provide Pikangikum First Nation with enhanced road access has received funding. Other activities, such as bridge design studies and road routing studies are being pursued by Muskrat Dam, Kasabonika Lake, and Wunnumin Lake First Nations, all with the intent to support and/or advance eventual all-season road development. Should Muskrat Dam and Pikangikum First Nations seek support to construct all-season roads upon completion of the studies currently underway, the proportion of remote First Nation communities pursuing all-season road development would increase to 21%. 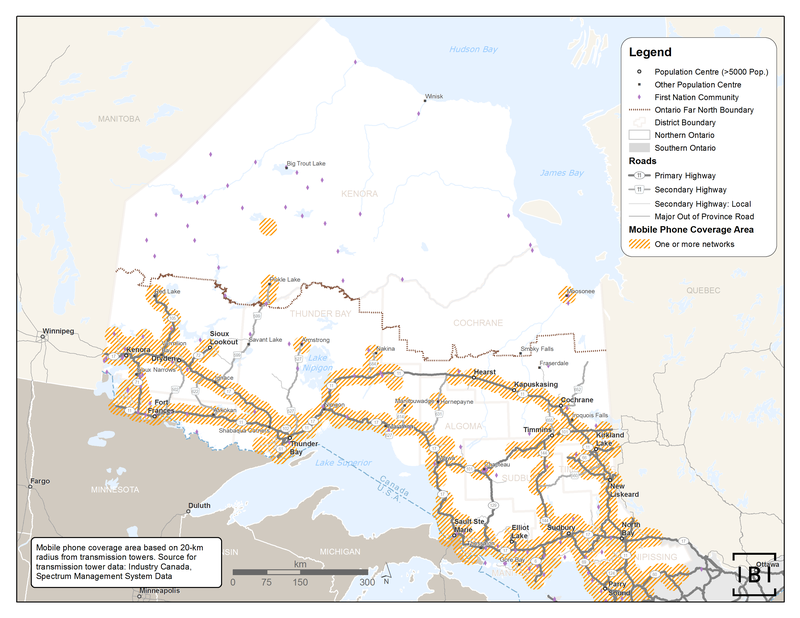 Mushkegowuk Tribal Council is also undertaking a Feasibility Study to construct an All-Season Road (ASR) to connect the Communities of Attawapiskat, Kashechewan, Fort Albany, Moose Factory and Moosonee to each other and to the Ontario Highway Network. Until communities located in the Far North are connected to Ontario’s electricity transmission grid or develop other renewable energy generation alternatives, diesel fuel will remain critical to their livelihood. During the 2014–15 season over 14 million litres of diesel fuel were trucked to remote communities by winter road, as well as approximately 6 million litres of gasoline (see Figure 17 for further information on truck trips by commodity on winter roads). Even once communities reduce their reliance on diesel fuel, seasonal winter road ground access will remain important for the transport of building materials, school supplies, and food. Due to fluctuating winter temperatures and more frequent storms, the winter road season is shorter, less reliable, more vulnerable to intermittent closures, and more difficult to manage from a construction and maintenance perspective now than decades ago. The landscape that winter roads are constructed on is changing. Figure 18 is one example of mapping work that NOMTS undertook to display winter roads in a detailed manner. Specifically, these maps show the alignment of winter road corridors, some kilometric length markers for long stretches, and numerous water crossings. This is the most detailed mapping of winter roads undertaken by the MTO to date. As part of this exercise, 10 distinct winter road corridors were mapped, with a hydrology layer applied in order to better show difficult or long water crossings. Analysis of Environment Canada data since the 1950s, described in the NOMTS Climate Change working paper, estimates that the season has shortened by about 12 days on average, and it is conservatively estimated that it will shorten another eight days over the next 40 years. At the same time, there is a wide variation of weather conditions from year to year, making effective planning of winter road operations a challenge. To help gain a better understanding of winter road traffic, and enhance knowledge on the winter roads for communities, shippers and governments, MNDM installed vehicle counters at four corridors during the 2015-16 season (see Figure 19 for weekly vehicle counts on four corridors). The counters recorded vehicles of all classes in both directions. 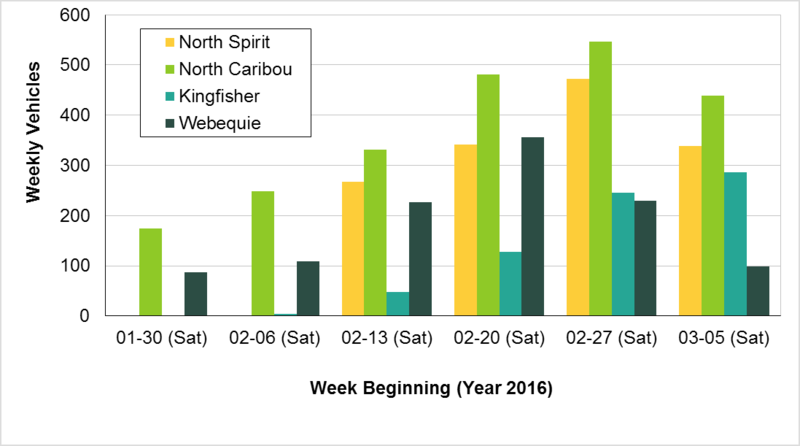 To note, the 2015-16 operating season started late and finished by early March 2016. For these four corridors, two-way traffic over the course of the operating season totalled almost 5,500 vehicles, with 700 to 2,200 vehicles per corridor. In terms of monitoring driver issues and compliance on winter roads, currently limited enforcement capacity means that there is a greater risk that drivers may be driving without updated licenses or insurance, or may be speeding. Road construction and operational standards are beginning to be inspected by MNDM; however, there are no standards with consequences for non-compliance. For remote communities, the entrance of contraband substances via winter roads and remote airports continues to be a challenge. Signage on winter roads is another gap. Existing signage can be sparse, ad-hoc, and difficult to read. Travelling on winter roads requires advance knowledge of the routes, given that distance, directional and hazard signs are not common. MNDM and INAC published winter road guidelines in 2010 with community guidance, which contains some guidance on signage. Signage is currently the responsibility of the communities or corporations building the winter roads; however, with limited funds that do not always cover the road costs, little may be left over for signage. Other safety considerations for driving and navigating Ontario winter roads is limited information on road quality, opening or closing dates, driving information, limited places to stop and rest, and sparse cellular coverage. Taking an example from other northern jurisdictions, the Government of the Northwest Territories (GNWT) has established online road information systems where winter road information is fully integrated with other highway information to provide drivers with up-to-date, current travel information. Users are also directed to a 1-800 number or Twitter to access real-time information on winter road conditions. For the supply of heavy and bulk cargo, it is vital that communities have winter road access. Heavy trucks are now commonly required to drive overnight when daytime temperatures are above freezing so that the roads are more frozen and sustain less wear (though this requirement is not easily enforced). However, this also means they are driving without light, and may confront unfamiliar or realigned routes with minimal signage. The winter road drivers’ journeys are increasingly onerous. Some supply chain companies noted challenges in finding drivers for the winter road network. Ontario’s 29 remote airports provide vital access to remote communities in the Far North, and are equipped to transport people and goods. Though these airports are adequate for current aircraft, some may lack appropriately sized runways or other infrastructure for emerging and future aircraft. Additionally, warehousing infrastructure at remote airports and near the winter roads network could assist with goods storage and goods affordability in the future. Remote airports are critical to the movement of people for personal or business matters, education, employment, health care, medevac/air ambulance, social services, policing, justice services, forest firefighting, and for the movement of essential goods to communities, including food and fuel. MTO’s Remote Northern Transportation Office (RNTO) estimates that its 29 airports handle approximately 140,000 movements or 70,000 flights annually across the entire remote network. Currently at least nine airlines provide scheduled passenger service to the Far North, and a number of chartered or non-scheduled commercial flights also take place between the Far and Near North. Additionally, approximately 2,500 medical flights are made by Ornge annually to the Far North, many of which occur during evenings and weekends, outside of the airport’s regular hours of operation (see Figure 20 for heat map of frequent Ornge flight paths to the Far North). Extending the service hours, or establishing an appropriate on-call system, would help serve these flights, and would allow operators to achieve increased efficiencies. Remote airport runways generally range from 3,500 feet to 5,200 feet in length. Most are gravel, except two that are paved: Pickle Lake and Armstrong. The compact gravel runways of remote airports limit aircraft used to smaller single and twin-engine turboprop aircraft. Most of these aircraft carry relatively small loads, up to 14,000 lbs for freight aircraft, which further increases the cost per shipment and contributes to the high cost of living in the Far North. Air carriers are expected to begin using new, more modern fuel-efficient aircraft in the next decade as current aircraft suited to gravel runways will no longer be manufactured. New aircraft may require greater runway lengths and higher surface compaction/bearing strength, meaning gravel runway lengths will likely not be adequate in the long term. Using gravel binding agents to treat runways may provide a lower cost option to paving which is logistically challenging and not cost effective at this time. Before lengthening runways to accommodate carrier needs, MTO will need to conduct a thorough analysis and investigation to support such investments. Of the 29 remote MTO airports, nine are equipped with Automated Weather Observation Systems (AWOSs). While these systems have improved air navigation in the region, communities and air carriers note that additional systems at strategically placed airports could help further improve aviation weather information. Enhanced, real-time information can allow for better decision-making by flight crews, provide information on alternate landing locations, and improve overall safety and reliability. Recognizing that it is challenging even to keep pace with basic housing needs for the growing populations in the remote communities, there is also a lack of indoor facilities for pilots, passengers and crew members at remote airports, a need that was often expressed in outreach and information-sharing on the topic of remote airports. This also includes concerns over lack of space and support for enhanced security screening of baggage moving into remote communities in order to better detect contraband substances. The remote airports are essential for emergency or medical evacuation, forest firefighting, and policing. Even if all-weather roads are extended to some of the communities in the future, there will still be a need for improved and well-functioning air services because of lengthy road travel times. Currently, none of the remote airports provide de-icing equipment or services. This means that carriers, such as Ornge, must carry glycol on its flight equipment and de-ice aircraft themselves while working to transport ill or injured people. While lack of de-icing is a concern for all air carriers operating in the Far North, the issue is most concerning for those carriers needing to carry out emergency services. Some carriers store a small supply of de-icing liquid at some airport terminal buildings. Additionally, if emergency flights are required on evenings or weekends, the airport foreperson or assistant makes themselves available to conduct runway inspections and prepare runways for landings, carrying out snow removal as required. The airports are not staffed after hours on evenings and weekends. Airport staff will provide after-hours services when they are available, but there is no guarantee of service. They are paid over time for hours worked when conducting runway inspections and snow removal work after hours. While runway lengths are sufficient for the types of planes currently serving the remote airports, longer runways would allow for larger evacuation planes in emergency situations. Some community populations in the Far North already exceed 1,000 residents, and communities in the Far North are expected to see the greatest growth rates relative to other Northern Ontario areas over the next 25 years. MTO is working more closely with communities to plan for emergencies and evacuations. As part of the Canadian aviation regulations, MTO has implemented a team to support safety, regulatory compliance, emergency management and training at the 29 remote airports. The training involves annual “tabletop”8 exercises, as well as live exercises every four years to ensure that the airport staff and community representatives are prepared for emergencies. The airports are each developing tailored Emergency Management Plans for their communities. Remote transportation infrastructure funding, maintenance, and oversight are complex and include many parties and multiple funders, from First Nations to various provincial ministries and federal departments. MTO fully funds, owns and operates the 29 remote airports, which may or may not be on First Nation reserve land. Some airports have accessed federal capital funding through the federal Airport Capital Assistance Program (ACAP). The airports are regulated by Transport Canada. While MTO had at one point developed airport agreements with the 29 remote First Nation communities, most of these have since expired and there is a need for modern, consistent collaborative agreements between First Nations and the Province. Winter roads funding is shared equally between MNDM and INAC, and is transferred to First Nations, who then use the funds to pay local road builders. The current funding criteria and timing of the transfer of funds for winter roads can create challenges for communities. Winter roads funding amounts are based on the kilometric length of the road, and do not account for local challenges, such as difficult water crossings. While INAC and MNDM may provide ad-hoc funding for such circumstances to communities, the current funding criteria do not account for this. MNDM provides operational support but does not have a capital budget for winter roads. When capital resources are required First Nations are directed to make applications to NOHFC, along with other potential funders such as FedNor. Further challenging this can be the timing of funds transfer for some communities. To receive funding, communities must submit budgets during the summer before the winter road operating season. Communities currently receive 75% of their allotted funding from MNDM between late October and December, and 100 % of their allotted funding from INAC in December, depending on various factors affecting the completion of transfer payment agreements between communities and funders. The remaining 25% is transferred on March 31. If communities need to engage in winter road maintenance activities over the summer, they must save funds from the previous winter to do so. Where the summer maintenance activities are costly, First Nations may apply to INAC and other funders such as NOHFC and FedNor for additional resources to conduct the work. Some communities delay shipments of goods until close to the end of the winter road season so that they are in a better financial position to pay shippers. This risks not receiving shipments if the operating season is unexpectedly shortened. Remote First Nations have expressed a desire for enhanced dialogue with governments regarding the operations and strategic planning for winter roads and remote airports. MTO, MNDM and INAC will need to discuss and approach these issues in a coordinated way with affected First Nations. Ontario is responding to climate change as a priority, through the Climate Change Strategy, Climate Change Action Plan and the upcoming release of a provincial Climate Change Adaptation Strategy in 2017. Climate change mitigation refers to actions that reduce greenhouse gas (GHG) emissions and thereby reduce the future extent of climate change. Adaptation refers to actions to deal with the effect (symptoms) of climate change. NOMTS will require consideration of both mitigation and adaptation. Utilizing tools such as climate change models and use of risk and vulnerability assessments throughout the region can assist in prioritizing potential actions as NOMTS is developed and implemented. Does this chapter describe the most important issues and needs for climate change and ecosystem health? What would you change or add? The impact to species at risk and their habitat needs to be considered as part of the evaluation of any road realignments, expansions of existing roads, development of new roads and/or the expansion and upgrade of any airport facilities and infrastructure. With respect to building alternate routes and or increasing connectivity to Northern Ontario communities and First Nations, consideration should be given to caribou, and other migratory animals, as linear features have a significant impact on the persistence of caribou. These impacts should be included when considering development of roads within caribou range. Additionally, if and when increased access to certain parts of Northern Ontario is contemplated, the potential increase of more targeted or incidental hunting or fishing as a result of increased access must be considered from both an environmental perspective and Indigenous traditional hunting, fishing and trapping perspective. As noted in Chapter 5, traditional Indigenous knowledge of the environment, and first-hand information on how climate change is affecting the region, are critical inputs to informing transportation planning. As noted in Chapter 5, winter roads have traditionally formed an integral link to remote communities and their reliability has been impacted by the effects of climate change. Subsidence (i.e. gradual caving in or sinking) of road, rail and airport runway infrastructure due to different freeze/thaw cycles or melting permafrost is linked to increased maintenance requirements. Climate change is also resulting in changes within the ecosystems surrounding our transportation network. Wildlife migration routes and spawning/mating seasons may change with the climate, requiring attention when planning, operating and maintaining transportation infrastructure. Adaptation to climate change can reduce vulnerability, increase resilience and/or reduce the disruption or damage to the transportation system and surrounding ecosystems. Adaptation can also result in opportunities to develop and support new modes of transportation within the region. There are a growing number of Provincial policies and programs requiring the consideration of climate impacts, particularly as they pertain to infrastructure investments, to be more resilient. For example, Principle 11 of the Infrastructure for Jobs and Prosperity Act, 2015 states that infrastructure should be designed to be resilient to the effects of climate change. Defining route planning requirements to avoid sensitive ecosystems and high-risk situations, such as flood-prone areas and steep embankments and/or cuts. Publication of an online tool that shows probability of intensity, duration and frequency of rainfall. Planned updates to 2008 design standards for highway drainage infrastructure, to account for potential climate change impacts. Frost/thaw depth and timing research to help assess effective timing of seasonal load restrictions. Design adjustments for remote northern airport facilities. Rolling out emergency electricity back-up at remote northern airports, traffic operations centres, and the Manitoulin Island Swing Bridge. IT disaster recovery/emergency operations facilities and procedures to support coordination of first responders, other transportation agencies, and emergency response centres across the province. Ongoing proactive maintenance to address high-risk areas for subsidence due to melting permafrost and erosion of embankments. New design, materials, maintenance and rehabilitation standards for roads and related infrastructure such as lighting and signs. Increased monitoring of high-risk infrastructure (e.g. automated spray technology to reduce bridge icing) and winter roads (e.g., ground-penetrating radar to measure ice thickness) to improve corrective maintenance and enhance safety. Shifting transportation modes as opportunities are presented, such as broader utilization of shipping as the ice-free shipping season expands. Monitoring the interaction of wildlife and transportation infrastructure as migration routes change and implementing measures to support biodiversity. The impacts of climate change, on the built and natural environment, are still emerging and being researched. Climate change and its impacts to the transportation system and the surrounding ecosystems need to form a primary consideration in developing the long-term NOMTS, while incorporating the flexibility to be responsive to emerging knowledge. Ontario’s transportation sector contributes 35% of the province’s total greenhouse gases (GHGs), more than the share contributed from industry, buildings, and other sectors.14 Within that 35% of emissions for the entire transportation sector, 70% come from road transportation and the remainder from air, marine and off-road vehicles. Ontario’s Climate Change Action Plan focuses on road transportation and includes actions to reduce emissions from the existing vehicle fleet through fuel standards, to promote low-carbon vehicles (e.g., electric, plug-in and hydrogen vehicles) now and in the future, to support cycling and transit, and to address goods movement by truck and rail. NOMTS will recognize the challenge geography poses in mitigating GHG emission from transportation within Northern Ontario. However, there are opportunities to reduce transportation impacts. For example, vegetative strategies (planting certain habitat) can build carbon storage and result in co-benefits for wildlife conservation and biodiversity. Under the Far North Land Use Planning Initiative, Ontario is working with local First Nations to prepare community based land use plans; the Far North Land Use Strategy will provide guidance that will help joint First Nation-Ontario planning teams consider potential climate change impacts when designing land use area designations. Reducing emissions from individual travel may focus on multi-occupancy approaches (e.g. support for improved intercommunity bus/vehicle and/or smartphone-based shared transportation systems, potential future selected increases in passenger rail service), but can also include new fuel technology as well as reducing single-person trips. The MTO has identified over 30 planned locations in Northern Ontario that will become part of the electric vehicle charging station network across the province. Emissions can also be reduced by supporting more efficient land-use planning where goods and services are closer together to reduce vehicle-kilometres travelled. Ontario has committed to providing funding to municipalities and large employers to plan for transportation demand management, and develop more options for transportation that reduce fossil fuel consumption and GHG emissions per passenger-kilometre for travel to work, school and recreational activities. As economic development continues within Northern Ontario, the volumes of goods and commercial movements are expected to grow. As noted in Chapter 4, summed across rail, marine and truck transport modes, approximately 115 million tonnes of freight moved to, from, within and through Northern Ontario in 2012. Air is also an important cargo transportation mode, especially for remote communities. It will take a multi-faceted approach across all available modes to reduce the transportation footprint related to goods and commercial services. Opportunities for innovative approaches and implementation of new technology may become available, such as the use of airships or hovercraft to facilitate all-season transportation in the absence of established ground transportation routes. Advances in the trucking sector continue to improve its environmental efficiency, through actions such as logistical planning, improved truck aerodynamics and fuel shifts in different classes and sectors. Through the Climate Change Action Plan, the Province plans to work with partners to establish a network of natural gas and low-emission fuelling stations for trucks. NOMTS can assist in identifying areas where such stations may be appropriate in Northern Ontario, particular in areas of heavy commercial truck traffic. Heavy trucks: 35 tonne-kilometres per litre of fuel. Per tonne-km carried, these findings indicate that rail and marine produce five-to-six times less carbon and use six-to-seven times less fuel than is the case for goods movements by truck. Depending on the type of cargo, different transportation modes need to be used to accomplish the highest efficiency and lowest carbon emissions. For example, the marine mode is not ideal for shipping light or small-scale cargo, nor goods that are perishable or must be delivered within a short timeframe. It is best utilized for heavy and bulk cargo, as well as non-perishable containerized freight. Also, marine and rail often require truck transport to move goods from the rail terminal or port to their final destination. Some remote airports in the Far North, including the airports at Nibinamik, Peawanuck and Poplar Hill, are increasingly utilizing renewable energy generation (e.g. wind and solar power) for airport operations. Transition to LED lighting technology has also been implemented to improve energy efficiency and reduce operational costs. These actions represent successes in Far North GHG mitigation. Stakeholders and community members have raised concerns that renewable energy systems are costly to service because technicians and parts need to be flown in. One of the biggest challenges for remote communities is high transportation costs and limited availability of access to goods and the provision of services. With the exception of James Bay communities, most remote First Nations communities rely on community diesel power generating stations. This results in significant GHG emissions from the transport and use of diesel fuel. However, plans are underway, to connect most remote communities to the electricity grid in the coming decade. Ontario announced in July 2016 that Wataynikaneyap Power was selected to connect 16 remote First Nation communities to the electricity grid. Wataynikaneyap Power is a consortium of 22 First Nations communities and a transmission partner (Fortis Ontario and RES Canada). Alternatives to diesel generation (e.g. renewable energy sources such as wood pellets, wind and solar) are being explored for the remaining communities where grid connection is not economical, including Fort Severn and Peawanuck on Hudson Bay. NOMTS will consider and, where appropriate, build on these initiatives. It is evident that there is a wide range of transportation issues in Northern Ontario, as well as a wide range of potential directions that NOMTS could take to improve the transportation system today and for the future. This chapter identifies strategic directions that have emerged from the technical analysis and outreach, and are being considered for inclusion in the Strategy. These directions are broad, guiding statements, and within each direction, the Strategy will identify and recommend specific priority actions to help proceed in that direction. Some of the directions are clearly defined, while others require discussion and refinement. These emerging directions are to help obtain input to NOMTS and should not be interpreted as final directions that will appear in the Strategy. Are these the appropriate emerging directions to refine and include in NOMTS? Taken together, would these directions result in the future transportation system that you think Northern Ontario requires? Would you modify any of the directions, and if so, how? Are there any other directions that are missing? What are some specific priority actions to consider, to progress effectively in these directions? Based on your feedback, and any additional analysis, MTO and MNDM will prepare a draft Northern Ontario Multimodal Transportation Strategy, for public input in 2017. Recognize the network of roads that go beyond MTO authority and coordinate and clarify responsibility, particularly for roads connecting to First Nations. This includes forest access roads (MNRF), NORT Roads (MNDM), winter roads (MNDM/INAC), municipal roads, LRB roads, and public roads maintained by First Nations. The ministries of Transportation and Northern Development and Mines welcome your input and feedback on the Discussion Paper Towards a Northern Ontario Multimodal Transportation Strategy. Please provide your input by December 16, 2016. Comments can be provided through the Environmental Bill of Rights Registry or shared through the project website: https://nomts.ca/contact-us/. A series of public information sessions is taking place throughout Northern Ontario in October and November 2016. For dates and locations, please visit the project website at www.nomts.ca. The ministries are also carrying out engagement with Indigenous peoples and communities during this time. The draft Strategy will be developed based on the input to this Discussion Paper and is anticipated to be released for comment and input in early spring 2017.